Los Angeles synagogue Valley Beth Shalom held it's sixth Memorial Day commemoration salute to living, as well as fallen veterans. Honoring veterans of all religious denominations, Rabbi Ed Feinstein and organizer Harvey Keenan welcomed veterans from the 1940's through the 2010's. 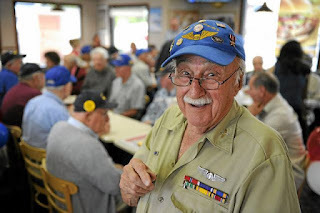 A number of airmen came from (and their colleagues) from "Wings over Wendy's," a Chatsworth veterans' group which has a number of Jewish War Veteran members. For the first time, many (younger people) are seeing and hearing veterans tell their stories in person about self sacrifice and serving one's country – a big part of the whole American story, Rabbi Feinstein says. “It’s become a nice thing that we clap for people serving now, but I remember when I was a kid, and the folks coming home from Vietnam were just not treated with respect,” he said. It’s a small token, but an important one. At the ceremony, veteran Robert Donovan, who served two tours in Vietnam with an air rescue team, will receive a special pin of respect honoring his service from Stephanie Stone, chief deputy director of the LA County office of Military and Veterans Affairs. The emphasis this year, though, is on women in the military, and the keynote speaker is 19-year US Air Force Lt. Col. Dena Delucia, who has already served three tours of duty in Kuwait, Afghanistan and Iraq, and this September she leaves for her fourth — back to Iraq where she works in civil affairs. Harvey Keenan has performed years of service in veterans' welfare activism in excess of his Korean War military service (had he not been deferred due to family hardship). He discusses his organized annual, Memorial Day recognition ceremony outside Valley Beth Shalom in Encino California. Air rescue pilot First Lieutenant Warren Weinstein discusses his experience and perspectives on veterans and liberal-biased curriculum in public school history education. Both Jewish and Israeli veterans participated in the recognition ceremony. Some of the veterans, such as Mark Thurston and Bob Donovan, also participated at the Memorial Day ceremony at L.A. National Cemetery on Monday. Bob Donovan volunteers with aging and impoverished veterans, as well as arranging external support through Operation Gratitude C.A.R.E.-type packages and letters from home. In the 2nd half of this clip, meet Lee Levitan, a Jewish, World War II bombardier who dropped bombs from European-launched US B-26's on Nazi occupied Europe. Arthur Sherman, another World War II USAF veteran, for years led the Wings over Wendy's Veterans group activities and educational endeavors. 100-year old Col. Nathan Jaffee, another veteran of WWII, who participated in, among other things, the Allies' invasion of France on the beach and the Battle of the Bulge - offers a look back and a look forward. 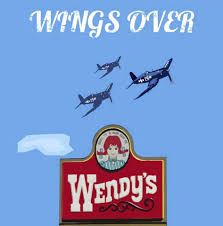 Members of Wings over Wendy's posed before their 16-year meeting place in February prior to relocating. ד"ר מרדכי קדר: "איך, שעשינו את זה 70 שנה, ישראל חייבת להיות נס." Exclusive film from April, 2018 at Israeli American Council ("IAC) Los Angeles, Shepher Campus: "A conversation with Dr. Mordechai Kedar" (in Hebrew) "How Israel's thriving for 70-years is nothing short of miraculous!"